The European starling's Latin name is Sturnus vulgaris -- vulgaris means "common." That name certainly suits the starling, one of the most prolific birds around. If you find a baby starling or fledgling, try to find the nest and put the bird back in it. If that's not a possibility, you can raise the baby and release it once it reaches a certain size. You also can release an injured bird after recuperation. Although starlings now inhabit most of the continental United States, they didn't arrive in North America until the late 19th century. Some Shakespeare aficionados got the idea to introduce all the birds mentioned in the Bard's plays to this continent, resulting in 60 starlings set free in New York's Central Park in 1890. The Seattle Audubon Society estimates there are now 150 million starlings in the country. The Migratory Bird Treaty Act, passed in 1918, protects migrating birds. 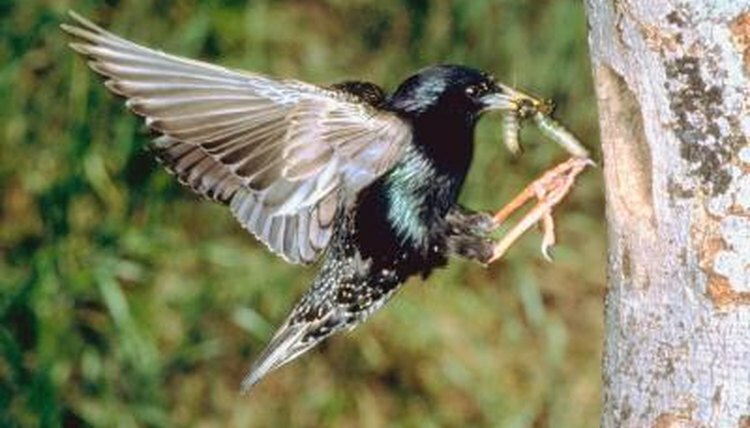 As an invasive species, starlings don't fall under the provisions of this act. That means, in most jurisdictions, you don't need a permit to remove eggs, the nest, baby or adult starlings. Because local ordinances might prohibit such removal, always check with your town before proceeding. If you find an injured starling, take the bird to an avian vet for examination and treatment. While the bird recuperates, keep him in a cage. Place the cage where the bird gets some sun but doesn't overheat. You can line a small container with tissue or toilet paper to serve as a nest. Fledglings might look like mature birds, but they can't fly. Feed the starling or fledgling a mix of soaked dry cat food, mashed hard boiled eggs and mealworms. Grind the eggshells up and add them to the mix as a calcium source. Fledglings can be released around the age of 24 days, if they fly easily in their cage. In the wild, they flee the nest much sooner, but the parent birds keep an eye on them for awhile. Release the bird in the area in which it was found. Release rehabbed adult starlings when they appear fully functional, again preferably in its home area. Since the starling is an exotic species and a nuisance, should you release the bird into the wild at all? While releasing large numbers of these birds is definitely a bad idea and environmentally harmful, a single specimen is a different story. As the New York State Department of Environmental Conservation website puts it, "Rest assured that releasing one bird is not going to make a significant difference in New York's starling population." Because starlings are a non-native, invasive species, rules that apply to keeping other wildlife in captivity don't necessarily apply to them. If you don't want to release your starling, or if an injured bird doesn't fully recover, consider keeping him as a pet. Starlings have been kept as pets since at least Roman times, where owners taught them to mimic human speech. In captivity, starlings have been known to live for 20 years. Keep in mind that once your bird is a pet and has been dependent on you for food for a long time, it's not safe to release him.